Reading Days @ Nigerian Baptist Theological Seminary, Ogbomoso, Oyo state, Nigeria. Final Examinations @ Nigerian Baptist Theological Seminary, Ogbomoso, Oyo state, Nigeria. 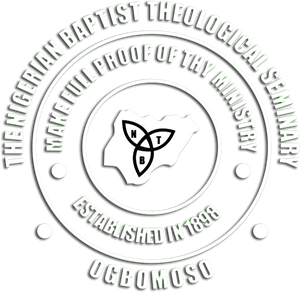 FOUNDER’S DAY SERVICE @ Nigerian Baptist Theological Seminary, Ogbomoso, Oyo state, Nigeria. All NBTS Socials/“Send-Offs” @ Nigerian Baptist Theological Seminary, Ogbomoso, Oyo state, Nigeria. COMMENCEMENT SERVICE @ Nigerian Baptist Theological Seminary, Ogbomoso, Oyo state, Nigeria. Picture Taking Day @ Nigerian Baptist Theological Seminary, Ogbomoso, Oyo state, Nigeria. Graduation Lecture @ Nigerian Baptist Theological Seminary, Ogbomoso, Oyo state, Nigeria. Senior Banquet @ Nigerian Baptist Theological Seminary, Ogbomoso, Oyo state, Nigeria. Award Night, WTC Graduation @ Nigerian Baptist Theological Seminary, Ogbomoso, Oyo state, Nigeria. 120TH GRADUATION SERVICE @ Nigerian Baptist Theological Seminary, Ogbomoso, Oyo state, Nigeria.